In the late ’70s, I worked in a tiny, family-owned independent bookstore in downtown Sacramento. Founded in 1924, it was the sort of place that publishers like Alfred A. Knopf and Bennet Cerf used to visit on their West Coast trips. Levinson’s only reluctantly carried paperbacks; the broad selection of classics in hardcover was a point of pride. One particularly slow afternoon, the lone customer, an older silver-haired gentleman, asked me why we didn’t have a copy of the then recently published Essays of E. B. White. We had it, of course—just not where he was looking (because it had gone immediately to our “General Literature” section instead of sitting on a mere bestseller table)—and I pulled out a copy for him. When he came to the counter to pay for the book, he admired our 1906 hand-cranked NCR cash register and started to pull out a credit card. The black-and-white author sketch on the front cover of the book was an exact match for the man standing in front of me. I laughed, surprised that I hadn’t recognized him earlier, and put the copy of Fahrenheit 451 back on its stack, next to the short stacks of The Martian Chronicles, The Illustrated Man, and Dandelion Wine, all lined up there on the counter, all with the same distinctive sketch of their author. And it still makes me happy that the first famous author I met was one of the writers who turned me into a reader in the first place. I was reading something somewhere about publishing this weekend and came across a mention of Sonny Mehta, chief of Knopf Doubleday, which completely discombobulated me. You see, three decades ago, I worked in an extraordinarily good little independent book store, a family-owned enterprise founded in 1924. Owners and even long-time customers had stories about the good old days when major publishing characters like Alfred P. Knopf and Bennett Cerf would visit on their western trips. When I worked there, we were still occasionally visited by authors of note. 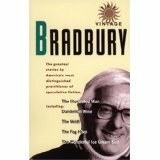 My favorites were Ray Bradbury, who simply wandered in one day looking for a copy of The Essays of E.B. White, which had just recently been published, while he was waiting for his train to Chicago, and Tracy Kidder, whose first book, Soul of a New Machine, had just been published to great acclaim, and who stopped in for an informal visit to see if we wanted him to sign his books if we had any on hand, which we did, of course, being the excellent book store we were. The most famous author who visited while I worked there was probably Ann Landers, who arrived in a limousine early one morning before we opened to sign 250 or 300 copies of her latest book before speaking at the convention center. She was disappointed at the “small” number of books we had for her to sign—”I guarantee you, as soon as I finish my talk, all those ladies are immediately going to walk right over here to buy this book!” (Not quite true, though we did sell several dozen that day.) Ms. Landers was astonishing, because from the moment she arrived in the store until she left a couple hours later to go give her speech, she never stopped talking, about the book, about her talk and her audience, about how our order had been too small. (After we opened, a young man who was buying a book saw her in the back and asked, “Is that who I think it is?” “Yes,” I said. “Which one is it—Abby or Ann?”) I’ve always remembered the trapped look on the face of poor Fred, the Doubleday sales rep who got to accompany her on her whole West Coast tour, when we waved goodbye as he followed her out the door back to her limo. In the late 70s and early 80s when I was a bookseller, there was already much lamentation over mergers and consolidations leading to the decline of independent publishers. There were the big publishing conglomerates—Random House, Harper & Row, Simon & Schuster, Doubleday, Viking/Penguin—and we judged them not only by their books’ content, but by the physical nature of their books beneath the dust jackets. Some publishers (Knopf, Farrar Straus & Giroux, Little Brown) appeared to assume that their books would be kept and valued in their customers’ personal libraries—the bindings were attractive and sturdy, the paper was dense and smooth, and the volumes were satisfying to hold. Others (McGraw-Hill, , Collins, Doubleday) seemed to think their books were ephemera to be kept only as long as it took to read them—the bindings were sloppy and uneven, and the paper was soft and spongey. Mostly, the quality of the content matched the physical form fairly well. But Knopf Doubleday still jars my mind. It’s like television from PBS Fox.